Mr. Lincoln to-day received a letter from Hon Wm Kellogg, M.C. – the Member from Ill. Who has been placed on the Committee of 33, raised by Botelers motion to consider the secession portion of the President’s Message – asking advice as to his action in the Committee. Kellogg had served as an attorney, State Representative, and Circuit Court Judge before winning election to Congress in 1856. He was called “Judge Kellogg” because of his six-year service as a Circuit Court Judge. As in the secession crisis, Kellogg sometimes took positions at odds with those preferred by Mr. Lincoln. 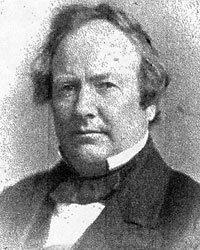 In December 1859, Mr. Lincoln wrote Kellogg regarding the controversy regarding New York Tribune editor Horace Greeley’s attempted intervention in the 1858 Illinois Senate race on behalf of Senator Stephen A. Douglas: “I have been a good deal relieved this morning by a sight of Greeley’s letter to you, published in the Tribune. Before seeing it, I much feared you had, in charging interviews between Douglas & Greely, stated what you believed, but did not certainly know to be true; and that it might be untrue, and our enemies would get an advantage of you. However, as G. admits the interviews, I think it will not hurt you that he denies conversing with D. about his re-[e]lection to the Senate. G. I think, will not tell a falsehood; and I think he will scarcely deny that he had the interviews with D. in order to assure himself from D’s own lips, better than he could from his public acts & declarations, whether to try to bring the Republican party to his support generally, including his re-election to the Senate. What else could the interviews be for? Why immediately followed in the Tribune the advice that all anti-Lecompton democrats should be re-elected? The world will not consider it any thing that D’s reelection to the Senate was not specifically talked of by him & G.
“This was the concession Lincoln had refused to make,” wrote Lincoln scholar Jay Monaghan. But Kellogg was also refusing to take abuse for proposing it. Chicago Tribune editor “Joe Medill, getting ready now to leave Washington, sent a scorching letter for publication in Chicago. [Charles] Ray published the letter, and Kellogg, when he read it, determined to give Medill a farewell thrashing. He met the editor in the National Hotel and knocked him to the floor. Out in Illinois, the Tribune cried, ‘If he [Kellogg] thinks to commend his valor to any portion of Illinois by making a midnight assault upon an invalid [Medill was crippled with rheumatism] we have only to say we believe he mistakes the temper of his constituents,” wrote Monaghan.7 The brutal attack brought a new round of denunciations of Kellogg around the country and in his own district. I am in receipt of a note from your private Secretary informing me that as a “mark” of your “confidence and esteem” you had appointed me Consul at Valaparaiso, Chile. Certainly the Honor, attached to the office ought to satisfy the Ambition of the most aspiring, and the Salary (which would but little if any more than defray the expenses of myself and family to & from the place of duty,) is as much as a reasonable man should desire; Yet I feel myself compelled to decline the appointment. At one time, I was indiscreet enough to indicate to your Excellency a desire for an appointment to any office, for which, I was vain enough to believe I was qualified but from the position now offered I am forced to conclude, that your Excellency held a decidedly different opinion from my own on that subject, or that my political status was such that the administration would suffer by my appointment to an office of the grade of those held by Peck, Wilmot; Olin, Fisher, Swett, Gurley and Carter and many other recent appointees. Kellogg sought a cotton trading permit from President Lincoln in 1863 (Secretary of the Treasury Chase objected). Finally in 1864, Kellogg received an appointment in 1864 as Minister to Guatemala, but he again declined. He subsequently served as Chief Justice of Nebraska and as a collector of internal revenue. David C. Mearns, editor, The Lincoln Papers, p. 327-328 (Letter from William Kellogg to Abraham Lincoln, December 6, 1860). Frank van der Linden, Lincoln: The Road to War, p. 185. David M. Potter, Lincoln and His Party in the Secession Crisis, p. 299-300. Frank van der Linden, Lincoln: The Road to War, p. 184-185. Jay Monaghan, The Man Who Elected Lincoln, p. 218-219. Carl Sandburg, Abraham Lincoln: The War Years, Volume II, p. 48. Roy P. Basler, editor, The Collected Works of Abraham Lincoln, Volume VI, p. 261 (Letter to Secretary of War Edwin M. Stanton, June 5, 1862). Benjamin P. Thomas, Abraham Lincoln, p. 468. Roy P. Basler, editor, The Collected Works of Abraham Lincoln, Volume VI, p. 167 (Letter from William Kellogg, April 8, 1863). Abraham Lincoln Papers at the Library of Congress. Transcribed and Annotated by the Lincoln Studies Center, Knox College. Galesburg, Illinois. (Letter from William Kellogg to Abraham Lincoln, April 8, 1863).